It’s a sad fact that not every dog will be born into a loving home – so many are born on the streets or are abandoned early on by their owners. Kelsey was one of these dogs. She spent the early years of her life wandering the streets, living off scraps, and barely finding enough food to stay alive. That life took a dreadful toll on her body and spirit. 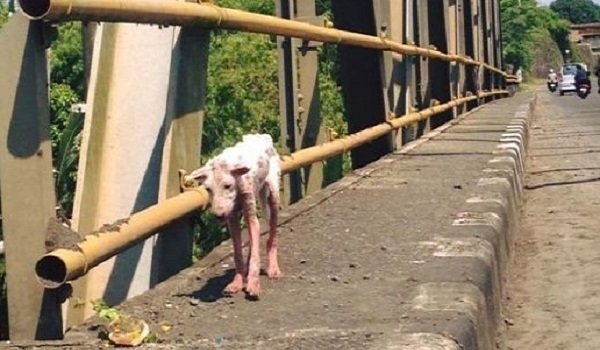 What rescuers found her on the side of a road, she barely even resembled a dog. Can you believe that’s the same dog from the first photo? I’m always amazed at the incredible things that can happen with the right amount of love and dedication. I’m sure Kelsey will experience nothing but love and happiness for the rest of her life. She deserves it. Share Kelsey’s incredible transformation with your friends who love animals below.